2017 has been a year to remember for fans of boxing. First we had the thriller that was Joshua vs Klitschko, then Canelo and GGG got it on. Now it is the turn of two of the best pound for pound fighters on the planet, and this is a scrap that is well worth staying up late for. Lomachenko vs Rigondeaux is a true boxing super fight and you can watch it live on BoxNation from 2am. If you are having a bet you should check out our preview and exclusive betting prediction below. Since turning pro back in 2013 Vasyl Lomachenko has risen through the ranks spectacularly. The Ukrainian fighter had a stellar amateur career behind him, winning two Olympic Gold Medals and two World Championships. He fought Orlando Salido for a World Title in just his second pro fight but he just came up short in a thrilling tussle. 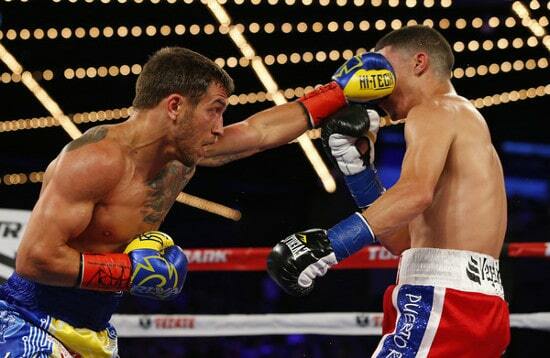 That was too much too soon for Lomachenko, but he hasn’t looked back since. Lomachenko is unbeaten since that defeat, winning 7 in a row and retiring his last three opponents. He is a fearsome operator in the ring and there is very little that he can’t do. His counter punching is a joy to behold, he has power in both hands and his footwork is exemplary. His best professional probably came against Roman Martinez, a fight he won by way of knockout in the fifth round. He made Martinez look like a novice that night, landing counters at will and running rings around him. The right hook that put Martinez to sleep was particularly vicious and he also carries knockout power in his left hand. The skilful Southpaw has speed, power and accuracy in spades, and plenty will fancy him to do a demolition job on Rigondeaux. However, the Cuban is probably his strongest opponent to date and Lomachenko won’t have it all his own way in Madison Square Garden. Just like his opponent, Guillermo Rigondeaux has an astonishing amateur record. Also a dual Olympic Champion and World Champion, the Southpaw has yet to taste defeat as a pro. Described by Freddie Roach as “probably the greatest talent I have ever seen’, Rigondeaux is a boxer with a multitude of skills. His hand speed, counter punching and defensive skills have made him into one of the best pound for pound fighters on the planet. Rigondeaux is the current Super Bantamweight Champ and he steps up in weight to face Lomachenko. The big worry for Rigo fans is his slightly suspect chin. He has had to get off the canvas more than once before fighting back for victory. Donaire, Amagasa and Cordoba all knocked Rigondeaux down when they fought. However, Rigo showed guts and heart to overcome the adversity and he fought back to take the win every time. 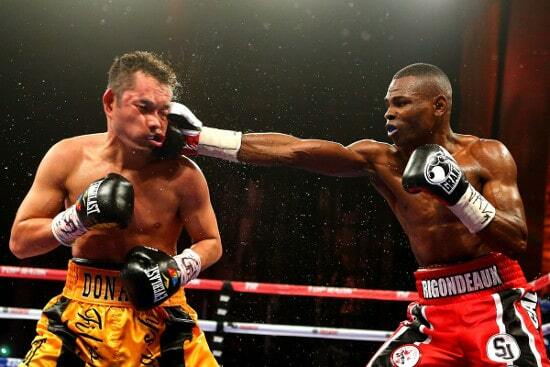 Rigondeaux’s best performance came when he absolutely destroyed Nonito Donaire. The Filipino pugilist came into the fight as a heavy favourite. However, he had no answers to the blinding hand speed of Rigondeaux. A flash knockdown in the 10th gave him a glimmer of hope, but Rigondeaux coasted home and took a decision win. If the Cuban can put on a repeat performance in New York he could well pull off another shock win vs Lomachenko. The bookies reckon that Lomachenko is a certainty for this fight, but we disagree. 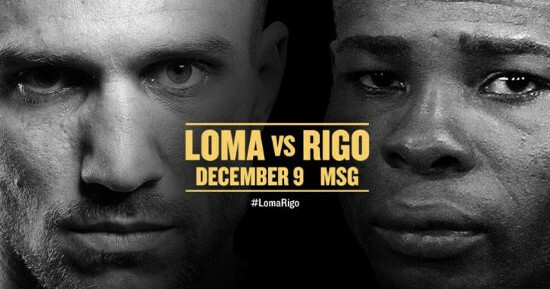 In all his previous fights so far Lomachenko had the edge on speed and footwork, but Rigo will be more than a match for him in those departments. Lomachenko has a clear advantage when it comes to power, but Rigondeaux is a very elusive fighter. As these two men are Southpaws this could be a scrappy fight and we think it could go to the scorecards. We don’t think there is going to be much between these two, and from a betting perspective the value definitely lies with the Cuban. We reckon that Rigondeaux will frustrate Lomachenko and he can maintain his unbeaten record with a decision victory. Our exclusive prediction for Lomachenko vs Rigondeaux is for Rigondeaux to win by decision at odds of 5/1 with Paddy Power.